Kennett Square Borough municipal offices are located at 120 Marshall Street, Kennett Square PA 19348; phone: 610-444-6020. The Kennett Square Historic District [†] was listed on the National Register of Historic Places in 1989. The Kennett Square Historic District has local significance in the areas of commerce, industry, and architecture during the period from 1800 to 1938 with emphasis on the period after 1855 when Kennett Square became an incorporated borough. The district served as a commercial center for the surrounding agricultural area in southern Chester County, a role still reflected by the surviving commercial buildings in the district. Industry also played an important part in the district's economy, and many historically important industrial buildings survive today. The architecture within the district evolved from early-nineteenth-century Georgian and Federal styles through late-nineteenth-century styles to early-twentieth-century styles. The buildings within the district in Italianate, Second Empire, Queen Anne, Stick, Colonial Revival, and other styles represent this architectural evolution. The Kennett Square Historic District retains an outstanding collection of well-preserved nineteenth century and early-twentieth century buildings that represent its commercial, industrial, and architectural development. For much of the first half of the nineteenth century the area that is now the Kennett Square Historic District was a small crossroads community in Kennett Township. The village slowly grew around the old road intersection at Union and State streets until it became the largest settlement in Kennett Township. The Lancaster Turnpike, America's earliest road west from Philadelphia, opened in 1794 but its route was north of Kennett. The Pennsylvania Railroad opened from Philadelphia in 1834 and reached Pittsburgh in 1850, but like the Lancaster Turnpike, it was well to the north of Kennett Square. Another rail route via Wilmington to Baltimore was some distance south of Kennett Square. However, the present State Street was an important early route between Philadelphia and Baltimore. This road intersected smaller turnpikes to Wilmington providing a grain route for farmers. Another road along the present Union Street was a connection between the area north of Kennett and Wilmington. These secondary routes made Kennett Square an important local center even though the major transportation routes bypassed the town. In 1853 a group of residents petitioned for a charter to incorporate Kennett Square Borough. The charter was granted two years later. At the same time, local residents were among a group who incorporated the Philadelphia and Baltimore Central Railroad which would run from Wawa (Pa.) to Port Deposit (Md.) on the Susquehanna River. Although it took more than a decade to complete the entire 46 mile route, the tracks were in place from Wawa to Kennett Square before 1860, thus creating a rail link to Philadelphia. The line eventually became the Octoraro Branch of the Maryland Division of the Pennsylvania Railroad. The D.J. Lake Map of 1860 shows that development within the Kennett Square Historic District was concentrated along State and Union streets, with a few buildings on Linden and Broad streets. In the next two decades expansion within the district, attributed by local newspapers to the economic benefits brought by the railroad, outstripped that of any other community in Kennett Township or its immediate surroundings. Such growth remained on a small scale and the population reached only about 1,100 by the 1880s. The Kennett Square Historic District is significant in commerce because since its earliest days it has served the business needs of the surrounding agricultural area and villages. The earliest commercial buildings, taverns that served travelers passing through the crossroads, no longer stand, but some of the buildings, such as those built in the row house pattern between 100 and 108 West State Street continue to contain shops as they have done for over a century. Over the years grocery stores, restaurants, dentists, barbers, small variety stores, and other businesses have been located in these buildings. Today their occupants still include a shoe store, a mens-wear shop, and a restaurant. In the last quarter of the nineteenth century the commercial center of the district expanded to serve the growing population of Kennett Borough, Kennett Township, and other nearby villages. New commercial buildings had a distinctly mercantile appearance. In 1877 Theopholis Sickles built the Unicorn Block at the northwest corner of the intersection of State and Union streets. Sharpless Mercer carried on a general merchandise business at that prime corner location from 1878 until 1928, when Connor Brothers opened a drug store there. Other early businesses in the building included the local newspaper, a music shop, and a jeweler. In 1878 Evan Swayne built the two stores which form the Swain Block at the southeast corner of the same intersection. R.W. Bernard, C.W. Mercer, and Jesse P. Hannum operated grocery stores there for many years. In 1882 William Chalfant built a block of four stores on the northeast corner of the old crossroads. Chalfant's son ran a store selling coach and blacksmith supplies, paints, and building hardware. Later businesses in the building included a drug store, a hardware store, and the Kennett Trust Company, which occupied the corner location from 1908 to 1930. Today a department store and a drug store are in business on the first floor. Those three large buildings firmly anchor what has always been the most important commercial intersection in Kennett Square. Larger and more stylish than the older commercial buildings, they symbolize the district's role as available commercial center. Among the smaller late-nineteenth century commercial buildings, 120 West State Street has contained a cigar store and billiard parlor almost from the time of its construction. The Schmaltz building at 111-113 West State Street was the location of a stove and hardware business and is now a retail store and tavern. The Green Building at 123 East State Street, built in 1908, the Harvey Building built in about 1910 at 117 East State Street, the Bernard Building built in 1925 at 125-127 East State Street have contained stores and offices from the time of their construction and continue to serve the same purposes. The present Speakman Building at 320 East State Street retains the large display windows that were needed for its original use as an automobile showroom in the 1930s. Another building in the commercial district, 109 South Broad Street, was also an automobile distributorship. The Kennett Square Historic District contains some new commercial buildings, but the unusually large concentration of buildings that have served a commercial use for 60 to 100 years, in comparison to other nearby towns, attests to its historic role as the commercial center of the area. In the early nineteenth century a number of very small industries and mills located within the Kennett Square Historic District, but the district's industrial significance lies in the late nineteenth and early twentieth centuries. The American Road Machine Company on South Broad Street, the nation's first builder of machinery for the construction of roads, truly found its niche in the automobile age. In the 1890s it merged with a Connecticut firm, and by 1904 employed about 125 people. The company fulfilled a number of government contracts in both World Wars and continued to be an important local economic force until the 1940s. Five of the company's buildings still stand near the railroad track and serve an industrial use. A condensed-milk plant opened in 1903 beside the railroad track on Birch Street. The building later housed the Glacifier Company, which made shipping containers, and it is used today by the Mushroom Cooperative. Nearby stands the building of the Kennett Ice Manufacturing Company Ice plant, which was located conveniently close to the railroad so that it could supply ice for railroad cars. Kennett Township is today known as the "mushroom capital of the world." This industry started in the 1890s when local nurserymen tried growing mushrooms in their greenhouses. Harry Hicks, one of the town's mushroom pioneers, built the first building used exclusively for mushroom-growing in about 1900 at the corner of Willow Street and Apple Alley where it still stands. The mushroom industry expanded to canning and shipping and by the 1930s had taken over a number of older industrial buildings in the district. After the trolley suspended operations in Kennett Square in the 1920s, the Mushroom Growers Cooperative Association purchased the trolley company's power houses, car barn, and boiler house on Birch Avenue, which they still use. Although the Kennett Square Historic District did not become a large industrial center, it retains the buildings of industries that were important forces in the town's expansion and growth between 1890 and 1938. Those industries (with others that no longer exist) supported the workforce that in turn needed the housing and businesses that together created the community. 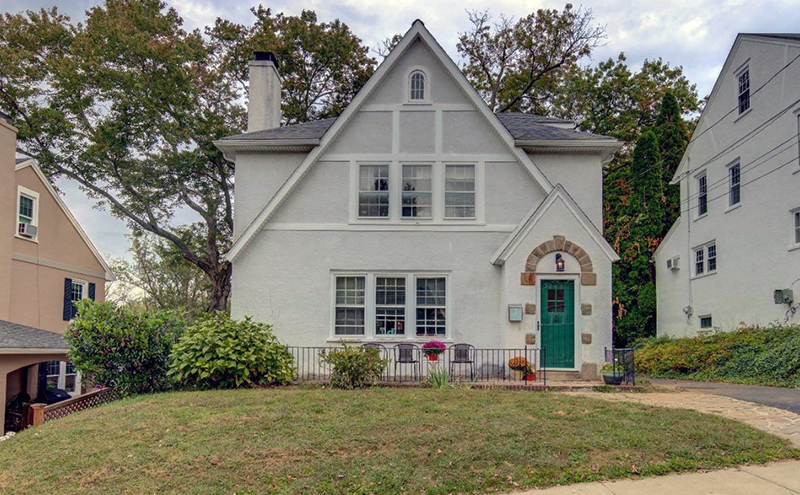 The architectural significance of the Kennett Square Historic District is based upon its outstanding collection of over 500 buildings, the majority of which are residential and date from the early nineteenth to the early twentieth centuries. The earliest buildings, Fairthorn and 200 North Union Street, for example, date from about 1800 and are in simple, but dignified Georgian and Federal styles. Additional buildings in variants of those styles appeared as residences along the two main streets, including 204 and 206 North Union Street, 227, 229, and 231 East State Street and 125, 127, and 129 West State Street. Toward the middle of the nineteenth century, row house construction continued on these streets as well as on East Linden Street (322-330 and 325-331). Following the Philadelphia pattern in a variant of Greek Revival and Italianate styles, those three-story, two-bay-wide houses sometimes served commercial as well as residential use, as they did in the 100 block of West State Street. In the middle of the century buildings in a wider variety of types and styles began to appear in the district, and construction further accelerated after the Civil War. Industrial and commercial activity within the district brought in new residents as employees and employers. Despite a brief slowdown caused by the Panic of 1873, a small local housing boom occurred in Kennett Square during the 1870s and 1880s. A shortage of housing for industrial workers spurred speculative construction of duplexes, single-family dwellings, and row houses. Builder-architects and pattern books often supplied the inspiration for houses incorporating elements of Stick, Gothic, and Second Empire styles. William Chalfant, a local businessman, banker, and speculative builder, oversaw construction of his own home at 220 North Union Street. A flamboyant rendition of the Queen Anne style, the house retains most of its original features, even though it now contains several apartments. The Dixon House at 423 South Broad Street and the slightly later Schmaltz House at 120 Marshall Street are other large houses in the same style that were homes of the local elite. In the pre-World War I years construction of both speculative and custom housing continued. Examples of the latter, which the local press called "mansions," are the Scarlett houses at 503,511 and 521 West State Street built in 1908-1910. T. Elwood Marshall, a local industrialist, built an impressive house for himself in 1910 at 207 North Lincoln Street. As the network of streets expanded beyond the original crossroads, houses of more modest size but in similar styles began to appear throughout the district. In additional to residences, St. Patrick's Church on Meredith Street, built in 1907, and the "new" Presbyterian Church built in 1909, on South Broad Street are two stone Gothic churches that served the growing population. Construction in the period after World War I accounts for about one quarter of the contributing buildings in the district. Bungalows, Four-Squares, and Colonial Revival houses in large and small versions are scattered through the district but are more prevalent in the northwest section of the district and on the later streets such as Lafayette and Garfield. A few of the buildings in the district from that time are architects' designs. St. Patrick's School at the corner of Meredith and Cypress streets was designed by the Philadelphia architect William H. Hoffman. The New Century Club was the design of another Philadelphia architect, Walter Ferns Price, who was also responsible for the new Baptist church on West Street. Two local contractors, William N. Worrall and George B. Scarlett, built many of the houses of the period in the district. Worrall had a staff of about 50 men and purchased the Avondale quarry which supplied much of his building material. Although Kennett Square shared with the rest of the nation the woes of the Great Depression, Pierre S. du Pont, president of E.I. DuPont de Nemours and Company, and a resident of nearby Longwood, decided to assist the community in the construction of a new school. He contributed over $730,000 toward the Kennett Consolidated School, which dominates the southern portion of the district. Designed by Wilmington architect E. William Martin and built by the William M. Francis Company of Wilmington, it was touted as the largest and best-equipped consolidated school building in the United States. The school has been in continuous use since its dedication in 1931. Another public improvement, the construction of the present Municipal Building on North Broad and Linden Streets, occurred in 1938. The Kennett Square Historic District is an outstanding collection of buildings of the nineteenth and twentieth centuries that together convey a sense of the history and development of the community. Residences and commercial buildings are most densely located near the original crossroad around which the community grew; they expand outward from this commercial center with their dates and styles reflecting the growth of the town. The borough includes land beyond the district, where there are modern housing developments, small shopping centers, light industry, and some undeveloped areas. It is within the district that there is a cohesive group of buildings dating from 1800 to 1938. A strong interest in the community's heritage among local residents has resulted in an effort to keep much of the historic fabric of the buildings in the district This combines with generally good maintenance to create a sense of time and place and a high level of integrity. Intrusions within the district are primarily buildings that are too new to be considered contributing; most are in the same size and scale as the historic buildings and complement the streetscape. There is no other commercial and residential center of comparable age or size within Kennett Square Borough or Township, or in surrounding southern Chester County. Hamorton, Unionville, and Fairville, for instance, never grew beyond a small cluster of buildings. Although other crossroad communities, Avondale, West Grove, and Oxford, were also on the same railroad line they did not become the same type of regional centers. In comparison, the Kennett Square Historic District contains a fine collection of nineteenth and twentieth century buildings with a high level of integrity that reflects the architectural, commercial, and industrial history of the community. † Adapted from the original, National Register nomination document.